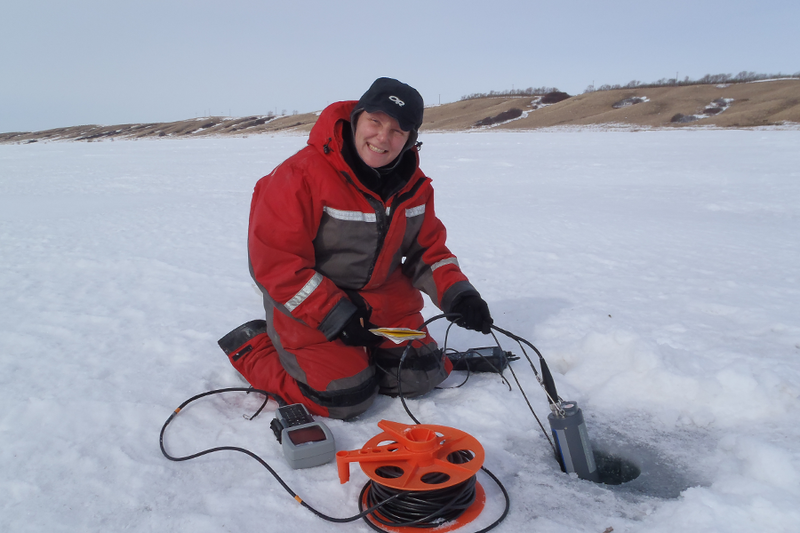 A team of U of S researchers studying the health of Lake Diefenbaker over the last few years has found that water flowing in from the South Saskatchewan River may be the principal factor affecting the lake’s water quality. The researchers—from the Global Institute for Water Security (GIWS), the Toxicology Centre, the College of Arts and Science, and the School of Envi­ronment and Sustainability— contributed to a special issue of the Journal of Great Lakes Research that showed what happens upstream has the most impact on the reservoir's water quality. Of the 15 articles in the special issue, the U of S contrib­uted 13 papers studying the physical, chemical and biolog­ical properties of Lake Diefen­baker and assessing the reser­voir's susceptibility to increasing stress. "It appears that the flow into the reservoir has the greatest impact on water quality," said Rebecca North, GIWS research associate and lead guest editor of the journal. "This could be a concern with increasing temperatures and lower water flows due to climate change." More than half of the papers in the special issue iden­tified changes in hydrology as a principle factor affecting water quality. While there has been public concern about the potential for declining Lake Diefenbaker water quality, especially related to surface algal blooms, the researchers found little evidence that supported this perception. "Algal blooms do occur in a portion of the reservoir—the Qu'Ap­pelle arm—but in the rest of the lake, blooms are generally infrequent and even less frequent than other lakes with similar nutrient concentrations," said North. North explained that the low frequency of algal blooms may be attributed to the mixing effect of windy lake conditions and a combination of high water flows for the study period, low light penetration due to murky water and low phosphorus in the upper water column of the reservoir. "We are predicting that the risk of algal blooms may be more prevalent during years of lower water flow, which we will continue studying in order to fully understand the factors affecting the water quality of Lake Diefenbaker." North added that for Lake Diefenbaker, it is the upstream activities and precipitation patterns in the Saskatchewan River basin that primarily dictate what happens to the flow levels and the potential for algal blooms. "Based on the data we have to date, it is not the individual activities in the lake, such as the presence of the fish farming facility, the discharge of treated wastewater or cattle along the shorelines, that pose a signifi­cant risk to water quality, it's the activities and weather patterns upstream," said North. "Phos­phorus input is of particular concern because under the right environmental conditions, fertilization due to phosphorus can create large-scale algal blooms." The findings suggest that land-management practices and efforts to reduce nutrient input should be focused at sites upstream to Lake Diefenbaker. "Of all the factors influ­encing the lake, the water coming from the South Saskatchewan is the most important. The less nutrients in that water, the better," said North.